I used the 2014 pond cleaning page as a guide to write this 2015 one but did change everything that was relevant or changed. It may look the same but it is not! 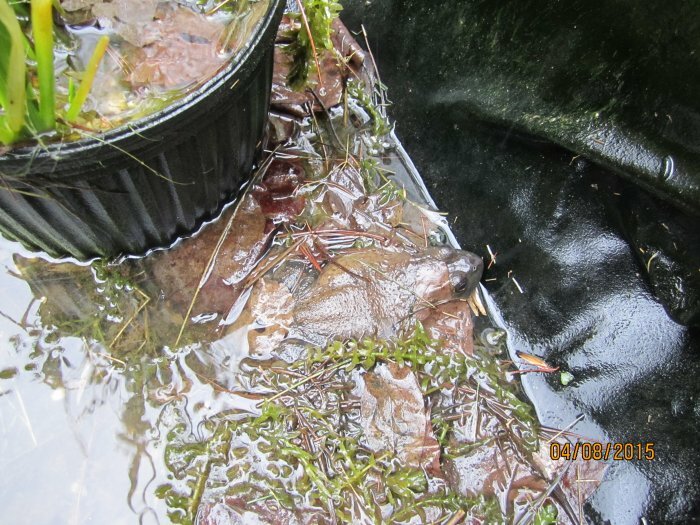 On 4/8/15, I cleaned out my 153 gallon pond. I had taken off 4/1/15 (the latest day in the past that I have ever cleaned this pond) but my brother wanted to go to a zoo so I had to wait a week. I took off every Wednesday in April to do yard work. I only get 10 vacation days per year. It went pretty much as planned except for the rain! It was super nice on Monday and Tuesday but not Wednesday! But, I am stuck with the day that I have off from work! I got up at 6:30 am and finished the morning animal feedings at 8:18 am when I started collecting supplies. The air temperature was 44 degrees F, and it did not go up but one or two degrees all day. It was drizzling. I decided to not put on longjohns or wear a hat because I was actually warm at first. I did need a baseball cap to keep the rain off my glasses so I could see. Later, my clothes got soaked so I put on a rain slicker (kind of a disposable one which is good because I got mud all over it). Soon after that, I had to go change completely as, wearing wet clothes, I was getting cold. I put on the longjohns this time. Supplies were all out at 9:01 am. Before starting the 153 gallon pond, I set up the mosaic pond for the year and was done by 9:14 am. 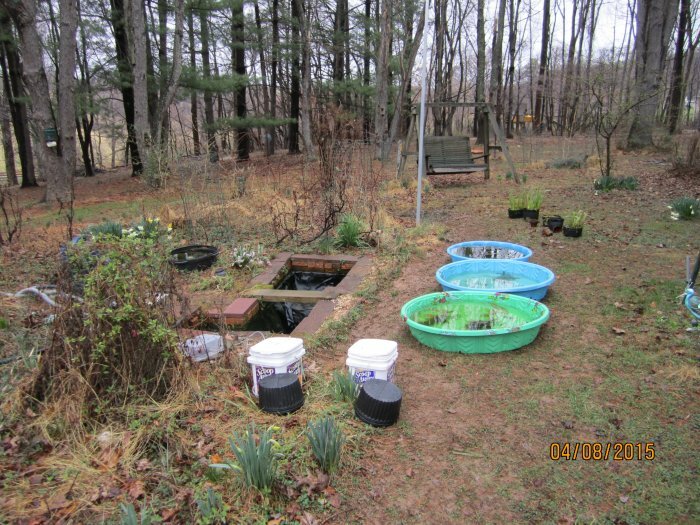 The 153 gallon thermometer read 52 degrees F. I bail filled two old kiddie pools (with holes), the smaller kiddie pool, and two holding buckets (one for the fish, one for the frogs). One of the big kiddie pools had big holes which I could not find before beginning (knew they were there) and got water all over the place making things more messy. The water was a little green with a lot of anacharis. I trimmed weeds around the pond and picked up leaves. I removed a bucket of debris from the pond's edge before starting to remove things. I hand sifted the entire pond. When I clean the pond, I bring up buckets and then go sit down on a gardener's kneeling pad. When I start, there is little debris so I pour it through an aquarium net and then look for movement. I hand pick out the frogs, snails, tadpoles, minnows, worms, and insects. In the process, I miss some of the snails, tadpoles, worms, and insects. I am sure I did not miss any frogs or fish. I squirted out the pond and used the OASE Pondovac to get all the rest of the stuff out. After the pond was empty, I changed out three regular bricks and one cap stone. The bricks crumble after a number of years. 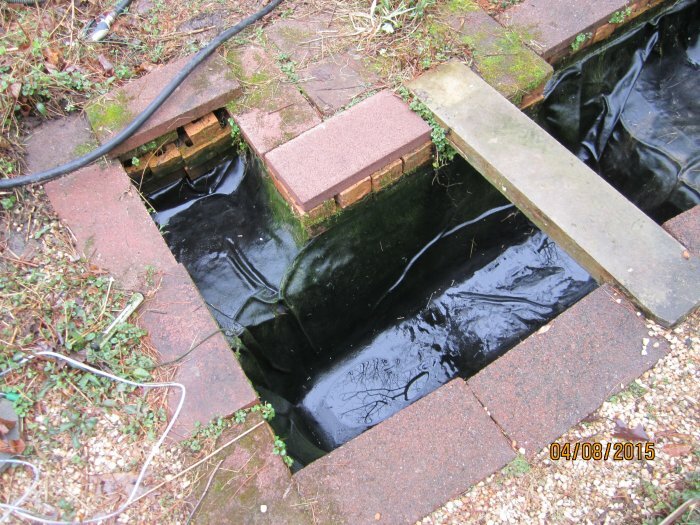 The ones that are above the water line tend to fall apart more than those below the water line. This year, I went in for lunch at 11:58 am with the pond empty and cleaned. I went back outside around 12:15 pm (forgot to record the time!). I had no strange finds this year unless you count a plastic net stake and a missing air stone. About 1/2 cup of pond salt (~25% of the recommended dose on the container for ponds with plants), a half teaspoon of BZT, a dose of pond Stress Coat, a little aquarium Stress Zyme, and a few tablespoons of baking soda. I let the Luft pump heavily aerate. I put back the water from the one kiddie pool without animals (aside from snails) in it. While the pond aerated, I hauled supplies back to the back rock pond. I netted out the leaves, sticks, and debris. It smelled horrible and filled the wheel barrow. I raked some leaves from the first few feet around the pond and got some debris up in the rocks. I saved a small wad of anacharis which I would put back. Aside from that, I found no life but I did not sift through the thousands of leaves. I heard a toad calling in a former farm pond on the property behind ours. The toads no longer visit me but I am glad that they are around. Once done with that, I got the PondMaster filter going in the 153 gallon pond. I bailed in the second larger kiddie pool which had just a few animals in it. I also put the frogs back in. I repotted the two two gallon pots of waterlilies from the bottom of the pond back in to the same two two gallon pots. I used dirt from the garden. Our dirt/soil is mostly clay with decomposed leaves. I put fertilizer tablets in as well. I potted up some extra waterlilies in to another two gallon pot which I put in the 50 gallon tub pond. In order to put it back in the deep end of the 153 gallon pond, I rolled up my pants, took off my boots and socks, and put on water shoes so I could step in to the water. I brought a towel to dry off. I squirted off the three clay pots (spawning sites for the rosy red minnows) and put the pots back. I put the fish back. I looked at the iris, so much taller than usual since I was cleaning the pond a few weeks later than usual. The growth was over a foot tall. Since I repot iris in the 1800 gallon pond every other September, I figured I really do not have to repot these iris every single March/April so instead, I just cleaned gunk off the top, fertilized, and put some fresh pea gravel on top. They had better give me more blooms as a reward! I put the smaller kiddie pool water, plants, and animals back. Everything was back in by 2:20 pm. There was a ton of anacharis in there and just a few sprigs of hornwort. I cleaned up a lot of stuff. I put some fresh pea gravel around the pond (did not remove old gravel though). I filled the 153 gallon pond to the top. Everything was up on the porch by 2:57 pm. Everything was put up inside by 3:46 pm. A few pieces of hornwort. No noticeable duckweed or terrestrial mint this year. I started with four pots. One was the purple iris which was in great shape and sits in the small marginal shelf by the overflow (it takes up the entire shelf). In the deep end of the pond was two two gallon pots of waterlilies. I think one fell down there last year as the pot did not really fit there and was distorted. I would return them both to the bottom anyway. In the main marginal area, there were two two gallon pots of purple iris. Two two gallon pots with waterlilies (probably Albata) in the deep end. Two two gallon pots with iris in the marginal area. 13 rosy red minnows (down from 31 the previous year, oh no!!) - approximately 6 males, 3 females (or immatures, too young to say if male), and 4 juveniles. One male was injured by rocks in the bucket that he was pulled out with. I hope he makes it! I found one dead juvenile rosy red minnow. 3 green frogs - 3 females I think. 1 wood frog - 1 male (no eggs this year in there yet anyway). 1 bullfrog - 1 massive female. 2 dead frogs - one 2" female wood frog (breeding female, not sure what happened to her) and one 2" juvenile green frog. ~28 green frog tadpoles; I counted them but may have lost count. 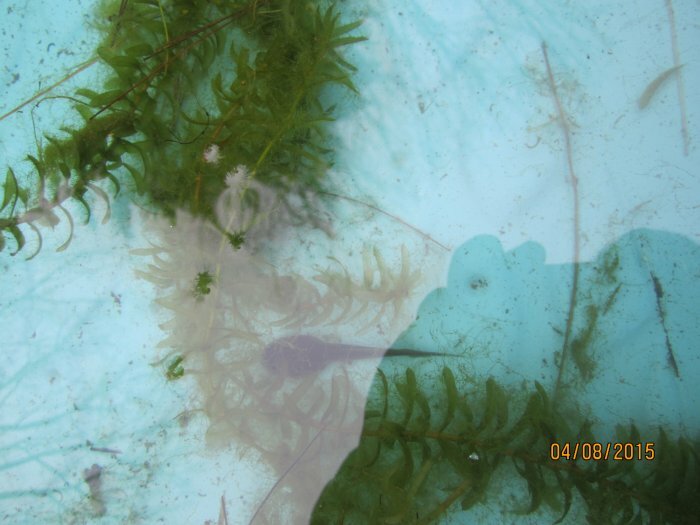 0 Eastern newts - the little guy was not there this year! ~50 ramshorn snails. These were black ramshorns but all small. I saved what I could but lost some. 1 small, black aquatic worm. 1 beetle - adult predaceous diving beetle that I have had before, Acilius mediatus . All of these photos were taken on 4/8/15. I did not link them in until July! This collection of photos is rather pathetic but do not forget that it was raining all day! 153 gallon pond - larger marginal shelf, mostly drained with a green frog sitting there. Work area around the 153 gallon pond, facing north. All my supplies sitting out by the pond can be seen. Empty 153 gallon pond - deep end.